Some of my favorite childhood memories are of the hours I spent sitting sideways across my grandfather’s big reading chair, one padded chair arm at my back, the other under my knees, and a book under my nose. 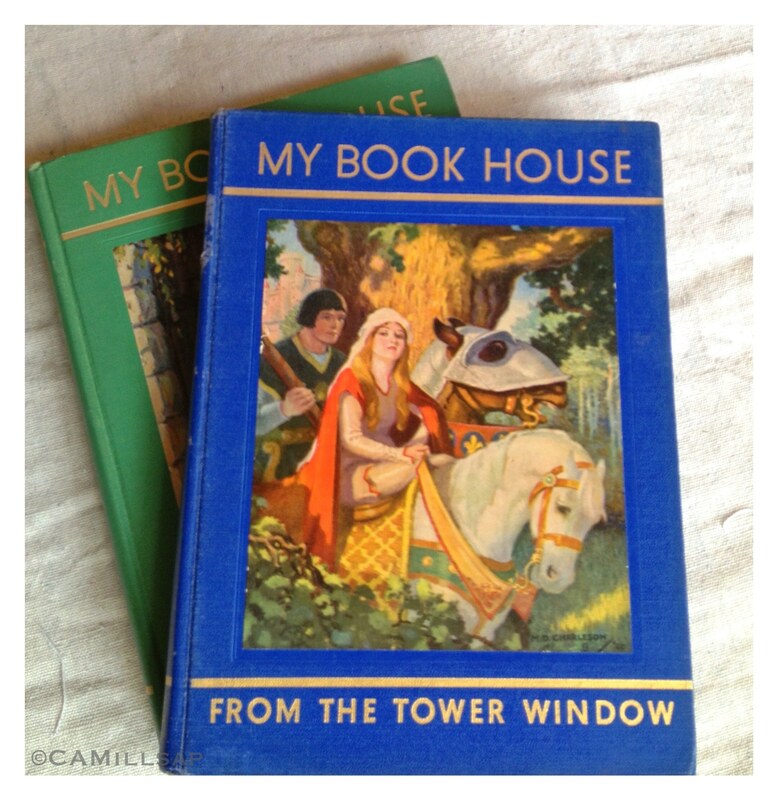 We had an old set of My Book House books, a classic collection of stories edited by Olive Beaupre Miller. They may have been my mother’s when she was a child, but for as long as I can remember they were on the bookshelf by that chair and I read them all. I liked the old-fashioned Nursery Rhymes and I was intrigued by the myths, but my favorites were the Fairy Tales. As a young girl my head was filled with the elaborate illustrations of tall castles with moats and towers, dashing knights in armor and fierce horses draped in colorful blankets and bridles. The day before I left for a recent trip to France, I dropped into The Vintage Rabbit. I’d been upstairs at the public radio studio to record audio essays for the upcoming weeks and although I was pushed for time, I couldn’t resist. I walked through quickly and was turning to go when I saw the distinctive green-to-blue “rainbow” covers of the books I’d loved as a child. The mixed-edition set was a bargain at only $28. Sold. I gathered the books, paid and left. I knew what would happen if I opened one so I put the set on a shelf near my favorite reading spot and didn’t go near them again until I was packed and ready to catch my flight the next morning. Finally, worn out from all the work that goes into preparing for any trip, keyed up and a bit stressed, I sat down and looked over what I’d bought. It was like going back in time. The stories and illustrations were so familiar to me I knew exactly where to find my favorites. A few days later I was walking down the narrow, curving, cobblestoned streets of Carcassonne, the beautiful medieval fortress city in the south of France. As I climbed up to walk along the stone walls, I thought about the little girl who’d buried her nose in fairy tales. The lucky coincidence of finding the books again was particularly sweet. Then, a week after my return from France, a friend and I drove down to the little town of Rockford to shop at Hurd Mercantile. One space was filled with vintage French items, including books. One 1907 book, ‘A Spring Fortnight in France’ was particularly intriguing. The cover was illustrated with an old photograph of the French countryside and it was about the travels of two young women who’d visited southern France more than 100 years before I’d set foot there. The chapter on Carcassonne had photos of the city as it had been at that time. Sold again. I brought it home and read most of it that night. I traveled on a modern Air France jet. I carried an iPhone, a digital camera and a credit card, but my trip was even more memorable because as a child my imagination had been fired by the illustrations in a set of story books. Then, when I returned home, I was able to contrast my trip with the words of a woman writing for other women more than 100 years ago. My own experience was bound with words and pictures from long ago. Cheryl-Anne Millsap is a travel writer whose audio essays can be heard on Spokane Public Radio and on public radio stations across the country. She is the author of ‘Home Planet: A Life in Four Seasons’ and can be reached at catmillsap@gmail.com.